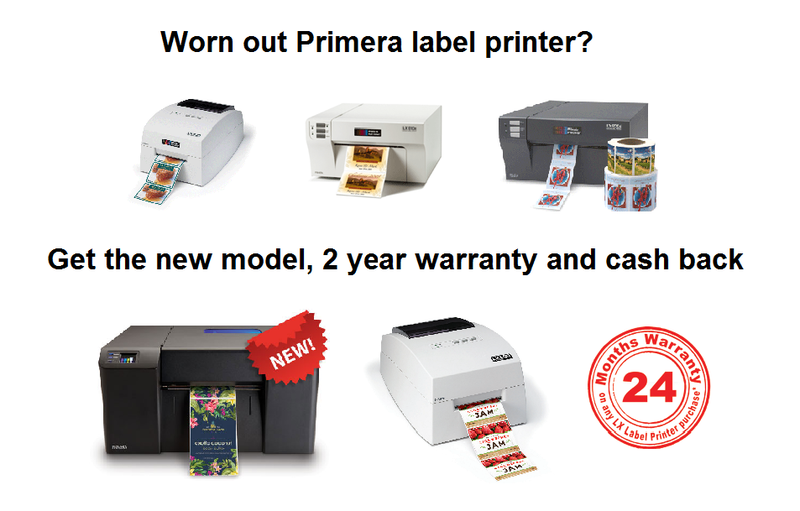 As the main focused distributor partner for Primera their colour label printers have been our best seller by far. The previously popular models LX400e, LX800e, LX810e and now the LX900e are discontinued models. We still sell labels and inks for these printers but if your machine is worn out you may be interested to get the new model, a new 2 year warranty, lower print cost and more durable ink. Replacing the old LX400e model and for users of labels rolls under 4 inches wide (102mm) wanting to continue to use the original vibrant dye ink then the new LX500e and LX500ec with guillotine cutter has further improved print quality and print speed. Or step up to the new LX1000e Primera's all new model for any label width up to to 8 inches wide (203mm) and new sunlight and moisture resistant pigment ink cartridges for low cost per print and improved print durability as well as extra fast print speed. Or consider the LX2000e, same new durable ink as LX1000e but with programmable end of batch automatic guillotine cut off and network and wireless connection as well as the normal USB. All models have the popular label by label print costing screen pop-up as a well as a fresh copy of Nice label or BarTender lite label layout and print software for your Windows PC or Laptop. There are two ways to get a good discount and cash back on the new model, use both ways if you like! Step 1) Send us a smart phone photo of the back of the old Primera printer you own showing the serial number and model number and with it claim over one hundred pounds discount on a new LX500e or LX500ec model and several hundred pounds discount on a new LX1000e or LX2000e model courtesy of Primera. Step 2) When the new printer is all up and running optionally send us your old printer and we will refurbish it and sell it for you or use as spare parts or cash back. When we can refurbish older Primera label printers they often fetch up to 50% of the original cost and the cash back is maximised if the unit is clean, operating and has all the original cables and box, though we can replace any missing items to maximise the value for you.